John corrects me right away when I ask if he is an exterminator. He tells me no. He says, nowadays, people in his profession are called Pest Control Operators. 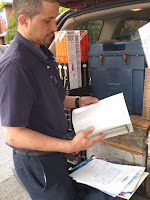 John has been working for the Bugban company for a year and a half and he really likes his work. He says, though he hasn't been in the business long, it feels to him like it has been much longer. He tells me, that he got into the business in a round about way. 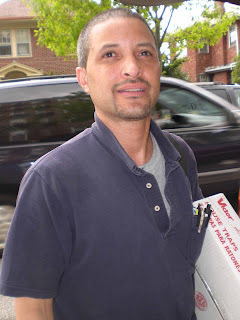 That he had been working as a porter for 13 years in a building in Jackson Heights, that was serviced by the Bugban company. Derek, the guy who worked the building, asked if he wanted some part time Saturday work. He tried it out, and forgive me for this, he caught the bug. He tells me that he worked with a guy from the company for quite a while to learn how it was done. He then had to take an 8 week 40 hour course to get his license. Now he works on his own and says, "I like the Freedom." 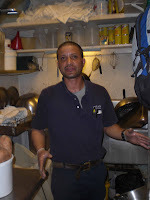 He says when he worked as a porter and cleaned floors nobody really cared about how well he did his job. But on this job, where most businesses should have, and every restaurant definitely does, his work is really appreciated. He tells me the long list of critters that he has to eliminate. Nothing phases him. He says that he is taking new courses all the time and that they are making the proverbial, "better mouse trap" all the time. He said he got so excited recently, when he was watching the Discovery channel, and saw of a new technology, that he called his boss Walter. The work, comes down to good old sleuthing, in some ways. You have to use your intuition but also you have to be able to read the signs. He says, "the more knowledge you have, the better chance you have to catch them." He tells me about a recent seminar he attended called the New York city rodent academy. Remember, the school is not about building a smarter mouse, but a better pest control operator. John says the course was great. I ask him what his biggest problem is, and he says it is this critter on the right. 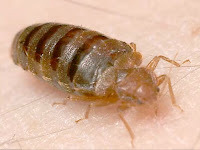 This is a bed bug, and he says, that they are scary for the industry and the public, because they are not connected to dirt. He says, "bedbugs are a real nuisance and the most dangerous." He tells me, that he can be working on getting rid of them on the job, and if he is not careful, he can bring them home by mistake. He laughs, and says, "I am never ever going to bring a mouse home." He tells me that taking care of roaches is easy. He says that when he is called in, it is a last resort. He says that most places can solve their problems by having proper sanitation. I ask John what he likes most about working the job and he says it is simple, "I am a people person." Then I ask if there is anything spiritual about his work. He pauses thoughtfully and remarks, that it is funny that I should ask. He says, "I get a satisfaction to myself that I am making people happy, by doing this I am fulfilled." Thank you John and Pest Control Operators everywhere. It is tangible that John loves to do his job. Just for clarification - I think the guy you photographed is not a bedbug.